Artists Alliance Inc, in collaboration with artist Dina Weiss, is proud to present Ground Floor, a participatory art project that explores potential uses for the ground floor of the Seward Park Urban Renewal Area (SPURA) as untapped capital in the Lower East Side. Taking place during the New Museum’s IDEAS CITY Festival, Ground Floor will provide visitors with a forum for brainstorming, discussion, mapping, and collaborative art-making. Ground Floor participants are invited to join expert-led walking tours of the SPURA sites, take self-guided tours using specially designed maps, and contribute to a growing photo archive documenting the existing sites, along with their vision for a new Lower East Side. Festival participants are encouraged to post their images to Twitter, Facebook, and Instagram, using the hashtag #SPURArt to share their vision with others and tap into a virtual community discussion/archive. 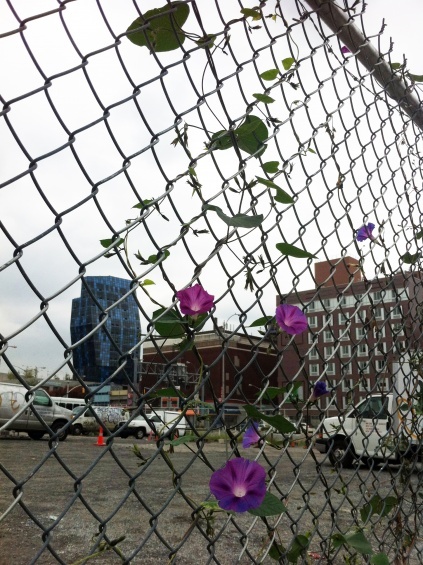 Other participatory components include: open discussions at our StreetFest meeting table & the Delancey Pedestrian Plaza, chalk drawings at location sites, and a collaborative art project recreating the naturally growing morning glory flowers that cover the fencing surrounding the renewal site. A very special thank you to artist Dina Weiss for bringing her project and vision to our organization. We would also like to thank the following organizations for their generous support and collaboration: New Museum, The Lowline, LES BID, and Municipal Art Society. This event would not be possible without the creativity and partnership of each of these organizations as well as the help of all of our volunteers. IDEAS CITY explores the future of cities around the globe with the belief that arts and culture are essential to the vitality of urban centers, making them better places to live, work, and play. Founded by the New Museum in 2011, IDEAS CITY is a major collaborative initiative between hundreds of arts, education, and civic organizations. This year’s theme is Untapped Capital, with participants focused on resources that are under-recognized or underutilized in our cities. IDEAS CITY is a four-day Festival of conferences and workshops, an innovative StreetFest around the Bowery, and more than one hundred independent projects and public events that are forums for exchanging ideas, proposing solutions, and accelerating creativity.